If you are following my blog here please know that I went back to blogger. Why? Because I couldn’t post my giveaway without paying money to make it all work and I’m just not ready to do that yet. I loved many many things about wordpress and I will be back at some time in the future as soon as my blog grows enough that it’s worth spending the money on it. So please follow me via Facebook or sign up via email over on Blogger to get your updates on what is going on in my life! Since we have moved away from my parents I have started looking for fun ways to include them in our lives even from a distance. Today we made these long distance hug Valentine gifts to mail to them. My plan was to make them Monday and get them in the mail but since we were in Colorado on an unplanned trip we had to make them a little later. But they are in the mailbox waiting to get picked up. We started with tracing hands and cutting them out. Then we moved on to coloring, glitter gluing and adding pompoms. After that we made a little Valentine note and added it to the middle of the ribbon. We glued both hands onto the end of the ribbon and let it all dry. (I added tape for extra measure on the hands. Don’t forget to stop by and enter my GIVEAWAY! 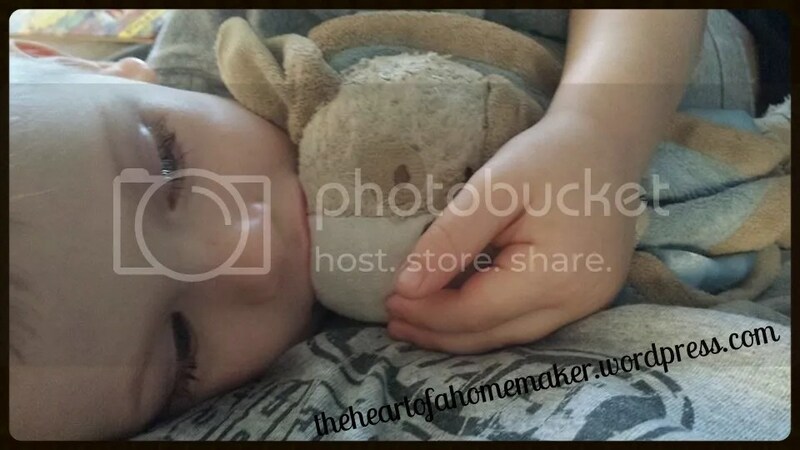 I decided to Google “What is a Homemaker?” before I wrote this post and I was brokenhearted by what found online. Urban Dictionary was the worst. The awful things that are said about being at home raising children is downright awful. I remember being a small child and wanting to be a mom when I grew up. I remember being told that wasn’t a career choice so I had to choose something else. I chose teacher. It was the closest thing to a mom I could pick. So I joined Future Teachers of America club in high school along with other groups that allowed me to work with younger children and get a feel for teaching. Then after high school I headed to college and preceded to waste money on an education that I only used for two years of teaching. Then I became a nanny and then a mom and haven’t looked back. How many people in the workforce can actually say they wake up every morning and head off to their dream job? I don’t think it would be that many. But I’m a lucky one! It’s not watching TV and eating BonBon’s. It’s hard work every day. It’s caring for other peoples needs 24 hours a day. I’m on call at all times. Hubby needs a healthy meal to get him started in the day. Boys needs food ALL DAY LONG along with teaching, play time, and cuddle time. It’s waking up in the middle of the night to change wet sheets or help an upset tummy. It is never ending cleaning each day. No matter how much I get accomplished there is always more. It is running errands, managing finances, and getting out into the world to enjoy other people outside our little home. It’s reading stories, making crafts, playing games. It’s teaching respect, manners, and many other character qualities that take hours of instruction on top of the regular reading, writing, arithmetic. Homemaking is serving others almost every moment of every day. But I wouldn’t trade this life for anything. My boys know that I’m always there for them whenever they need me. They know they are safe to explore new things where ever we go because mom is there to help them through whatever the new task might be. Homemaking is watching my children grow, learn, and experience life with me! Homemaking is so much more than just cleaning house, folding laundry, and cooking meals. It’s more than just sitting around and wasting time romance novels, watching TV or checking out of reality on social media. Homemaking is being present in our daily lives and the lives of those we hold closet to our hearts every moment of every day. Homemaking is a positive in both my life and the life of my family. 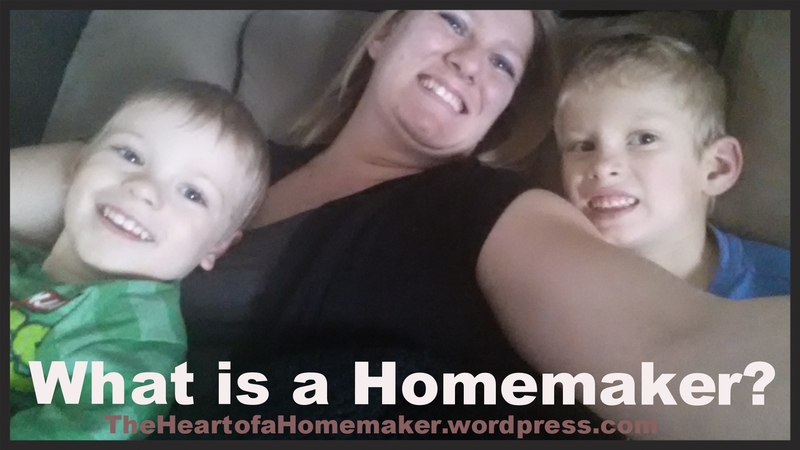 So what is a homemaker? A homemaker is a person who is present daily to serve those who are most important in their life. That’s what I believe a homemaker is! Please share what your thoughts are about being a homemaker! Everyone knows that homeschooling requires patience. Of course so does almost every aspect of parenting. To me it doesn’t require any more patience than every day parenting. However, it does require extra work that most parents don’t experience. Today is an extra hard day. The boys woke up earlier than normal. We haven’t done any “real school” for about a week because Hubby was home. Plus Goose bit his lip pretty bad so every time he touches it he starts screaming. So today is requiring some extra patience but also LOTS of flexibility. I would say patience and flexibility are the two main parts of homeschooling that I need to remember. Honestly because of my background in education and actually teaching 4 and 5 year olds as a career choice the teaching part comes pretty natural to me. But watching my son struggle over sounding out the word ‘old’ and breaking down and crying over the fact that he just hasn’t figured it out yet is heart wrenching. I look at it as such a simple word. And I have seen him successfully sound it out. I’ve also watched him get upset, calm himself down and sound it out correctly and the excitement on his face. So today when he started melting down that’s what I expected to happen but after several rounds of crying, calming, sounding out and still not getting it I knew it was time for some flexibility on my part and some tough love. It was time to send him to my room to take an early rest/nap time. He naps about 75% of the time and I think it’s because he’s waking early and going to bed late. But today he needed mom to make the choice that nap time needed to be early even though it was not something he agreed with. And now he’s fast asleep. Hopefully when he awakes we can eat some lunch and then get started on school again. So to all you new homeschoolers or one that has been doing it for years…remember it’s hard work but we can all do it. Remember that you are not alone in your daily struggles and when you or your children are having a hard day lift your family up in prayer and remember think about the other mama’s that are walking through the same path you are. Sometimes all it take is knowing that you are not alone!